Briefly: The Metal Hurlant TV series (aka. Heavy Metal here in English land) is completed and is already picked up for broadcast in France with more territories including Germany and the UK in talks. Fitted for the international market, each episode will be 26 minutes long and composed of a single, heroic story that, according to producers, will involve action, heroic fantasy and Science Fiction in english, directed by Guillaume LUBRANO. Cast includes Scott Adkins, Michael Jai white, Rutger Hauer, Darren Shahlavi, Matt Mullins. 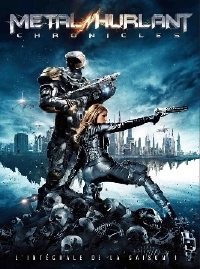 The Sci fi / Action TV Series adapted from the famous comics book Metal Hurlant (aka Heavy Metal in US) starring Rutger Hauer, Scott Adkins, Michael Jai White, Kelly Brook, James Marsters, Joe Flanigan, Michelle Ryan, David Belle...directed by G. Lubrano. In the lineage of fantastic series such as Twilight Zone or The Outer Limits, Metal Hurlant Chronicles is the adaptation of the world renowned magazine of the same name. Discover the live versions of these exceptional comics by the writers of X MEN , BATMAN , SPIDERMAN, IRON MAN , GI JOE , STAR WARS , SUPERMAN, BLADE etc. i'd rather have a tv series about the chronicles of riddick. cool, never heard about it in germany!